Partnerships are at the core of CGIAR’s work. 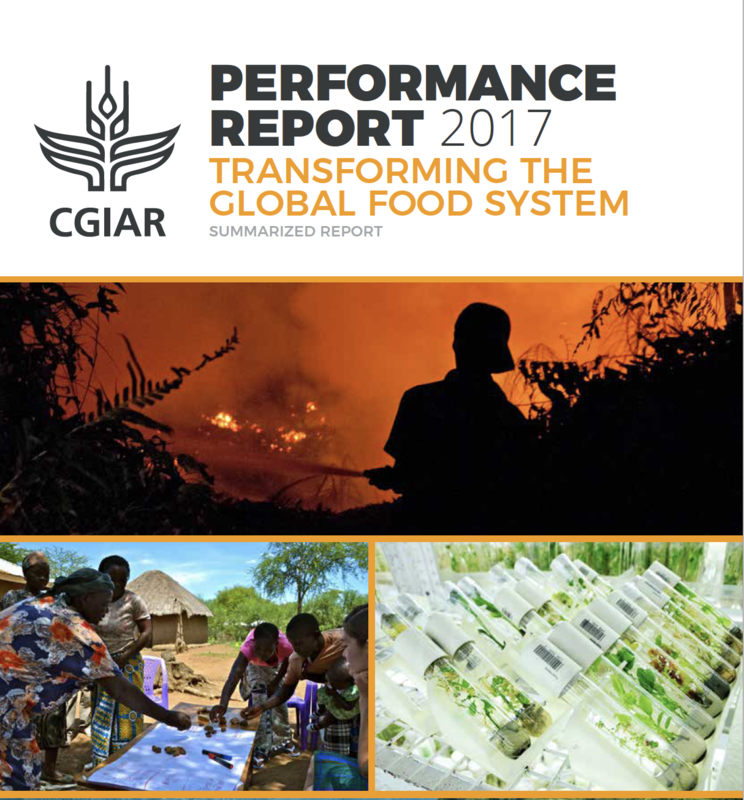 In 2017, CGIAR programs reported a total of 1,961 external formal partnerships. These involved a wide range of partners, from policymakers in governments and international agencies, to research collaborators in other research and academic institutions around the world, and public and private sector companies and non-profit institutions involved in development and scaling of innovations.1 The distribution of formal partnerships reported by phase of research for development (R4D) is shown in Table 1. A small selection of examples of partnerships in 2017 is given in Table 2 and a more extensive list is available in Selected external partnerships in 2017. 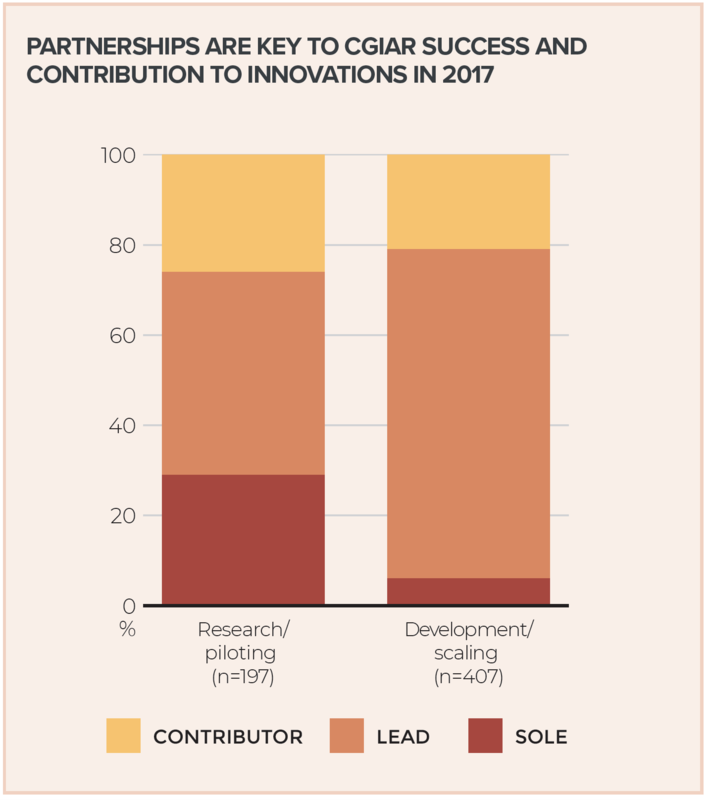 Analysis of the innovations2 reported in 2017 also shows how vital partnerships are to CGIAR Research Programs (Figure 1). Overall, only 14% of innovations were tagged as being the ‘sole’ product of CGIAR and of these, nearly two thirds (61%) were at the first stage of innovation (discovery/proof of concept). At the development/scaling stage, 94% of innovations were the product of joint work: in 73% of cases the CRP was the ‘lead organization’ in a partnership, while in 21% of cases, the CRP was a ‘contributor’ to a team led by partners. The 2017 IEA Evaluation on Partnershipsi found that more than half of partnerships, in all the categories considered, have been established since the introduction of CRPs, including new engagement in different kinds of partnerships for scaling and a deliberate efforts to involve more non-governmental organizations. “CRPs have been influential in both increasing Centers’ collaboration within the programs and positioning of external partnerships along the impact pathway” (page ix). In addition, many programs and platforms have reported increased engagement in global multi-stakeholder platforms (collaborations between governments, private sector and civil society to tackle complex problems). Partnership models are being customized to suit different types of partners and geographical locations, and almost all research outputs and publications are now based on collaborative work. Challenges identified by the evaluation included the need for clear strategy and planning for partnerships, greater clarity on management of public-private partnerships at system level, and further sharing and learning from experience. The Synthesis of CRP Evaluations, also contained an important message (p.3): “The quality of partnerships with research partners in the ‘South’ could be improved by engaging them more fully in the entire research process from the design stage and by addressing the power imbalances that may result from their role as subcontractors for much of the CRP research”. The evaluation’s recommendations, in particular the need for every CRP to have an updated partnership strategy, were broadly agreed oniii by the System Management Board, and are being implemented. Vietnam World Bank Supporting situational analysis of food safety in Vietnam; collaborating on two major food safety investment reports. International Agroinformatics Alliance Collaboration on secure data handling and cleaning. BIG DATA Agroknow Inc * Pilot of Semantic Web application to agricultural data exploration and mining, and development and delivery of the CeRes data harvester. India Agriculture Insurance Company of India Limited* Development and scaling out of insurance products and engagement with the Ministry of Agriculture, Farmers and Welfare. CCAFS Green Climate Fund Informing the Fund strategy for investing in transformative actions in agriculture. EiB Syngenta Foundation & Market Edge Consulting* Leveraging Syngenta sponsored projects about creating impact in CGIAR breeding programs. EiB Roy Cantrell * Collaboration on process and potential teaching opportunities. Egypt Central Laboratory for Aquaculture Research, Egypt Hosting of the Abbassa Aquaculture Research and Training Facility in Egypt. Community Scaling partner for small-scale fisheries in the Pacific region. and integrated landscape management for smallholder forestry. and Verification of forests and carbon. National genebanks Hosting safety duplicates on behalf of partners or colleagues. Method vaccine for East Coast Fever. Agricultural Research Institute Coordinating sheep and goat research nationally and responsible for aligning objectives of the International Fund for Agricultural Development (IFAD) funded project with the national strategy; the regional centers are responsible for implementation of agreed project activities in the seven value chain sites in Ethiopia and support the project with staff time and facilities of the designated local research centers. Kenya Kenya Agricultural and Livestock Research Organization and Agricultural Research Organization Elite germplasm for product development. Purdue University Diverse yellow/orange maize germplasm for provitamin A enrichment. Asia and Pacific Region Asia-Pacific Association of Agricultural Research Institutions Agricultural Science and Technology Indicators (ASTI): Leading capacity strengthening and data collection on agricultural R&D indicators in Cambodia, Indonesia, Lao PDR, Malaysia, Myanmar, Papua New Guinea, the Philippines, Thailand, Timor Leste, and Vietnam. Food and Agriculture Organization of the United Nations (FAO) FAO’s Monitoring and Analysing Food and Agricultural Policies Program is a partner in a series of policy-oriented research studies, and FAO’s Special Program on Youth Employment in Africa team is collaborating with PIM on the forthcoming book “Youth and Jobs in Rural Africa”. International Land Coalition Scales up the use of Collaborating for Resilience approaches through 22 National Engagement Strategies. Kenya Cornell University and Makerere University Capacity building, Design, Analysis and Communicating results (by Gender-responsive Researchers Equipped for Agricultural Transformation, GREAT). LEHNER* Piloting precision application technologies. be shared widely with RTB Breeding teams as appropriate. Intertek Lab* The High Throughput Genotyping platform is a genotyping project. The service is provided by Intertek Lab which became operational in 2017 and offers high-throughput single-plex SNP assay for forward breeding (marker-assisted selection) at competitive rates. China Chinese Academy of Agricultural Sciences (CAAS), China, Beijing Joint labs, staff, research. Scientific Research Institute of Agricultural Economics Adoption and Impact Study in three countries, Central Asia. Internationale Zusammenarbeit (GIZ) Joint work to share project results with stakeholders, policy makers. Partnerships with the GIZ Soil Protection and Rehabilitation for Food Security Program: Piloting of soil fertility and soil carbon enhancing technologies in Benin, Burkina Faso, Ethiopia, Kenya, and India. Ethiopia Sustainable Land Management Project, Ethiopia Piloting and scaling of successful land restoration practices co-developed by WLE in Ethiopia. *Private sector entities. A longer (but incomplete) list of partnerships in 2017, is available in Selected external partnerships in 2017. A full partnerships database is under construction for the future CGIAR Results Dashboard. In an effort to improve the livelihoods of nearly 6 million cocoa farmers across Africa, Asia and Latin America who produce 90% of cocoa worldwide, the Global Network on Cacao Genetic Resources Conservation and Use (CacaoNet), coordinated by CGIAR, brings together actors from public and private sectors to facilitate cocoa breeding and many other activities, including the International Cocoa Awards. Against this backdrop, CGIAR in 2017 renewed its commitment to forging partnerships with private sector players as an important pathway to addressing its key objectives. CGIAR is focusing on building high-level buy-in and awareness for a market-based approach to private sector partnerships. Plans are well under way to drive systemic change across CGIAR to generate social and economic value from collaboration with industry. A survey conducted under the 2017 IEA Evaluation of Partnerships in CGIAR showed that “the percentage involving private sector partners [has] increased over time, from 15% established before CRPs began, to 19% early in the CRP period and 28% established later.”vi A small selection of examples of partnerships, including private sector partnerships, in 2017 is given in Table 2 and a more extensive list is available in Selected external partnerships in 2017. 1 Tagging by partner type was inconsistent for 2017, so it is not possible to reliably report numbers by type. 2 Innovations are significant products of Research for Development, such as varieties, technologies, methods or findings. The analysis covers only those innovations which were correctly tagged for ‘contribution of CGIAR’. 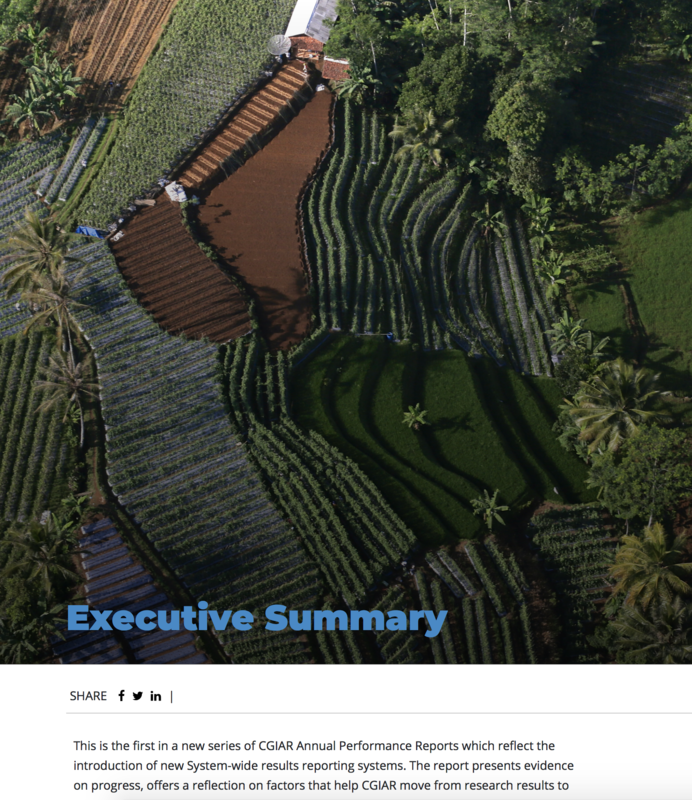 i CGIAR-IEA, “Final Report: Evaluation of Partnerships in CGIAR” (Rome, Italy: Independent Evaluation Arrangement (IEA) of CGIAR, 2017), http://iea.cgiar.org. ii FCGIAR-IEA, “Final Report: Evaluation of Partnerships in CGIAR”, p.2. iv K. Fuglie, “The Growing Role of the Private Sector in Agricultural Research and Development World-Wide,” Global Food Security 10 (2016):29–38. v M. Ferroni and Y. Zhou, “The Private Sector and India’s Agricultural Transformation,” Global Journal of Emerging Market Economies 9, no. 1–3 (January 1, 2017): 28–37, https://doi.org/10.1177/0974910117716406. vi CGIAR-IEA, “Final Report: Evaluation of Partnerships in CGIAR”, p.20.